Just a few miles north of Springfield, Ill., the 300 coal miners at International Coal Group’s Viper mine are gearing up to do something they’ve never done before: drive underground. After nearly a quarter century of continued safe and productive operation, ICG’s room-and-pillar Viper mine is steadily completing construction on a new slope portal that will replace two older shafts, allow miners to access new reserves, increase operating efficiencies, seal off decades of old works, and prepare the mine for another 25 years of operation. ICG Illinois’ Viper mine, originally constructed as the Shell Mining Co.’s Turris mine, was built in 1980-81 and went into production in 1982. In operation for more than 25 years, the mine started out as a steady 1 million ton per year (tpy) producer, growing to 2.5 million tpy currently. The new slope and portal project will allow the mine’s production capacity to grow to up to 3 million tons and perhaps more depending on the market for its approximately 46.1 million tons of Springfield No. 5 coal. 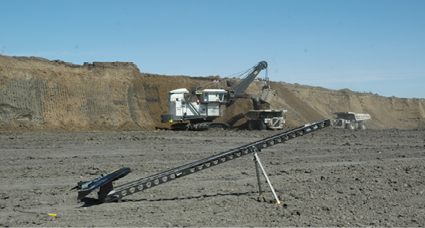 Once the new portal and slope are in operation, larger belt lines, improved underground transit times and enhanced conveyance will allow “the opportunity for increased growth if ICG elects to move in that direction and the market for Illinois Basin coal supports such a decision,” said Bob Gardiner, general manager, Viper mine. The new portal facility will also allow Viper to eliminate the operation and maintenance of more than 5 miles of underground beltlines and to seal and close the previously mined area. The construction is also a natural result of the exhaustion of much of Viper’s original resources over the life of the mine. It also represents ICG’s largest investment in the Illinois Basin. Beyond Viper, ICG owns more than 320 million tons of increasingly valuable IB coal. Viper is a room-and-pillar operation, using continuous miners and battery operated coal haulers. All of its raw coal is processed at its nearby preparation plant and shipped by truck to utility and industrial customers located in North Central Illinois. According to ICG’s most recent annual report, 68% of Viper’s coal is sold to utilities. A large majority of its coal is used by the Springfield, Illinois City Water Light and Power Co., which was its primary customer when the mine was first built. Viper is also located adjacent to the Union Pacific line running from Chicago to St. Louis. 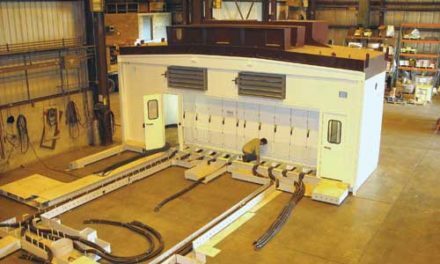 Though it is not currently rail-served, a rail loop and loadout for shipping unit trains has long been on the drawing board, and could potentially be constructed if market conditions call for such an investment. Beyond the new portal, Viper has constructed a new refuse disposal area which will serve the mine going forward. “The existing impoundment, constructed when the mine first went into service, is nearing the end of its life expectancy. The new impoundment and portal will also allow us to grow as we mine over the next 25 plus years,” said Gardiner. The new slope allows Viper tremendous efficiency gains as the mine moves into its future reserves. Equally important, it also allows Viper to eliminate 30 years of old mine works that stretch back all the way to the mine’s original Elkhart preparation plant, coal load-out and original mine portal and washhouse. “When this project is completed and our units are operating west of where we are now, Viper will essentially be a new mine. We’ll seal off the old works and we’ll have a new coal mine,” said Gardiner. Though miners descend into the mine from a newer shaft in Williamsville, all of Viper’s supplies continue coming in from Elkhart. “That’s where the main hoist and other facilities are—5 1/2 miles from Williamsville facility. From there we’re still another 6 to 8 miles out from where sections are currently operating. This infrastructure is requiring us to keep a lot of the old coal mine open. With the new slope, we’ll be able to come in closer to our new reserves, and eliminate everything from Williamsville to Elkhart,” said Gardiner. “We also have the high angle conveyor (HAC) that brings coal to the original coal preparation plant. We have to keep that whole original mining area open for the main conveyor. When we have our new slope in operation, we’ll have options to truck the raw coal to our prep plant or potentially to install a new overland conveyor belt, eliminating the need for maintaining all those miles of old workings,” said Terry Kelley, project manager, Viper mine. Plans currently being discussed—ICG has yet to make a firm decision—call for a new overland belt that would be built on mine property adjacent to the existing UP railroad line and on the grade of an old Interurban rail line. One design being discussed has the belt first going north and then east along the existing mine road that would be roughly 5.5 miles long. “We’ll either convey the coal that way or put it on trucks, and then use the state highways from the mine. The conveyor is an additional huge investment when you could begin trucking easier. It could be transferred back to the prep plant very efficiently one way or the other. The decision is yet to be fully made,” said Gardiner. Before commissioning a new slope, ICG sent Kelley and others to a variety of mines in the region to determine the best options. “We considered many plans: combine a new slope with a shaft, employ another HAC belt that would have been a lot bigger than what we have today. We also considered two HAC belts, then a 16˚ slope for our belt and supplies. We went around and looked at a lot of different sites and put our heads together and reviewed the options,” said Kelley. Eventually management decided to build an 8˚ slope used for a travelway and beltline. “Once we elected to go with it, we looked at several other mines that were beginning slope construction to compare designs,” said Kelley. Viper selected a two-compartment, over-under design, which has the belt on top and the travelway on bottom. A divider deck provides the option for two air courses. The new slope will be 1,986 ft from the opening to the coal seam. It then travels 238 ft horizontally to the existing Main West belt line. As the slope descends down into the Springfield No. 5 coal seam, Viper will have two 45˚ turnouts to the right that will connect to existing travel ways. The dual turnouts will make it easier for equipment and personnel to switch out. “Our underground travelways are already in-place. We didn’t want to create a situation where we might back up some of the man-trips, keeping them from getting to the production units, or hold up supply cars coming in,” said Kelley. “We’ve had shafts at Viper for 30 years, using slopes is new to everybody here,” said Gardiner. Driving up and down the slope and bringing equipment down into the mine in the slope are all relatively new experiences for Viper’s employees. “Some of this we’re just going to learn as we go. In all of our planning, we’ve been trying to address everything we could think of,” said Kelley. we had to rearrange a few things,” said Gardiner. Once Viper decided to go with the design it created, management interviewed various construction companies, settling on Pittman Mine Services to spearhead the slope construction. The project was an experience for Viper. In the beginning, there was a lot more to it than just moving downward at an 8˚ angle. To construct the slope, Viper has moved more than 300,000 cubic yards of dirt. “You have to remove all of the material that won’t support itself. As we proceeded, we moved all of the unconsolidated material out of the way. The bedrock is 42 ft below the surface. We basically dug a 7-acre hole at a 3:1 angle, which gave us a 220 ft by 345 ft flat rock surface to work on, to employ drainage control, and make it absolutely safe for people working around highwalls,” said Kelley. With its rock and geological layout, Viper wanted to minimize the width of the slope, electing to go high instead of wide to support the top. “We went 16 ft high and 16 ft wide. Once we started tunneling, we put our arches in, and put lagging over them and backfilled with concrete. The arches are sitting on top of a concrete footing all the way down,” said Kelley. The result is a solidly encased tunnel made up of more than 10,000 cubic yards of concrete with no voids. “Anything we cut out above the arches is backfilled with concrete,” said Kelley. Though Pittman has performed all of the construction and labor on the project, Viper’s Engineering Department has maintained oversight and ICG has also directly purchased and supplied all of the materials. One of the first challenges Viper had to deal with was water. “Before moving the dirt, we knew we had a 12-ft layer of sand full of water that had to be controlled. We installed a bentonite slurry wallaround the perimeter of our box cut to seal it off. We then installed 15 wells inside of the contained area and dewatered the sand layer,” said Kelley. “Slope construction work is something that the more you do it, the smarter you get,” said Kelley. During the construction process Viper also encountered a couple of layers of thick fireclay that had to be excavated out and backfilled with concrete as well. “We came across three layers that ran from 6 to 9 ft thick. While still maintaining an 8˚ angle through these areas, we cut all of the clay out flat until we hit material we could brow under, but you’re talking more backfill, cutting and pinning. We used roof and truss bolts, rib pins and other ground control methods, but mainly we just cut it all out,” said Kelley. As of this writing, Pittman has been on Viper property for about 11 months. “We’re at 1,660 linear feet now, roughly 300 ft from the top of the coal seam,” said Kelley. More importantly, all throughout the project, Pittman hasn’t experienced a single lost time accident. “They’ve been real good on safety and compliance,” said Kauffman. “We’ve had no major issues with the compliance of the contractor, very few problems; overall, they have a real good safety record. Not only safe, they haven’t had any accidents and minimal citations. Pittman has proved to be really good to work with. Even before they began construction, they strived hard to do it right. Thankfully throughout this whole process, we’ve really not encountered any surprises or issues that were unexpected,” said Gardiner. Viper uses their High Angle Conveyor (HAC) to move coall through the mine to the original prep plant. The HAC is a vertical belt, actually two belts, that run opposite to each other sandwiching the coal between them and taking it straight up out of the ground at more than 1,000 ft per minute. Historically, HACs were used to offload ships and cargo vessels. Viper was one of the first applications underground to use one. The current HAC, largely rebuilt after a 2006 fire, is about four years old, performs well, but is limited in size and is maintenance intensive. “Though it’s 60-inches wide, we can’t use the full width of the belt as it’s used to hug the coal. It’s a high maintenance belt requiring a crew working 24/7 to keep it running,” said Kauffman. Currently all of Viper’s equipment goes into the mine down a 24-ft diameter shaft. Most major equipment has to be taken apart, hoisted vertically to the bottom in sections and then assembled underground. “With the new slope, now you can take it off the truck and drive it straight into the mine,” said Gardiner. Just as importantly, Viper will soon be able to convey coal outside instead of having the HAC vertically hoist it out. The new slope will also sport bigger 60-inch main line belts. Viper employs all high performance units but does not fantail or fishtail its air. It runs up to four units of Joy and Bucyrus miners. The new slope and conveyor system should give Viper the ability to run three units at any given time which could provide a potential boost in production, again if called for by the market. “We have four sections but our belts and HAC limits the amount of production. Currently we can’t run three supersection size crews as we’d have to limit their production. Replacing the HAC will allow the mine to run three flat out with a fourth unit moving into place while the other three are producing,” said Kauffman. The new portal should be going into service by the first quarter of 2011. “We might be fully cut into the coal seam in early January, we’ll be within 10 ft, around Christmas,” said Kelley. The next phase will be recovering the Elkhart to Williamsville mine section throughout the subsequent 24 to 36 months and then sealing off those sections. 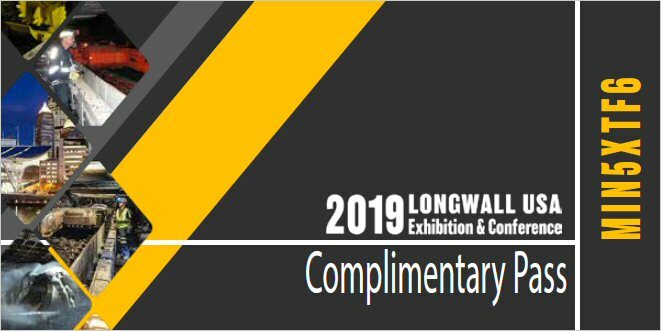 “After being in operation for more than 25 years, we have over 16 miles of conveyor belt and water lines in those older works. Everything has to be recovered, moved out and then sealed off. We have 37 belt drives, 16 miles of conveyor or 32 total miles of belting, all of which have to be maintained and examined three times a day,” said Gardiner. One immediate benefit will be the reduction of travel time. “Naturally it will grow, but reducing travel and transit time from the top of the new slope to the coal face will allow us to use those hours as production instead of transit. It’s now at least 20 minutes to the face in all directions from the newer Williamsville portal. But hauling supplies in from the new facility is what is really going to save us as we won’t be bringing in supplies all the way from Elkhart. Essentially we’re taking a 30-year old coal mine and condensing it into what amounts to a new mine,” said Gardiner. Not only does this project represent ICG’s largest investment thus far in the Illinois Basin, this construction represents the first major capital investment in Viper since it was built in 1982. “Other than normal running and maintenance, the new slope construction is the first major investment for the long haul in the history of the mine. This will ensure better operations for the next 25 years,” said Gardiner. Combined the slope and impoundment projects will have an important effect on the operation, production and work flow of the mine going forward, allowing Viper a level of operational flexibility it hasn’t previously enjoyed. Gardiner is quick to point out Viper already has an excellent workforce. “We have a very dedicated people with tremendous expertise. That goes a long way. It’s something that you don’t have to rebuild and it’s something that can’t be replaced,” said Gardiner. Once Viper has completed the next several sealing phases following the slope’s integration, Viper will become a “significantly smaller mine with the capability to perform the same tonnage levels or above. We’ll have the same capacity just with a much smaller footprint,” said Gardiner. Though it’s been in continuous operation for approaching three decades, quite a few of the original coal miners hired by Shell still work at Viper. These “old heads” including Kelley, Gardiner and Kauffman are enjoying the privilege of passing on what they’ve learned. “It’s a rare opportunity. We’ve lived through how this mine has run, and over the years, we’ve largely been successful at mining coal. What we’ve seen and learned gives us a chance to build a new generation of folks who can internalize our culture and further strengthen it,” said Kauffman. “As we move forward, ICG fully intends to be a leader in safety, training and operational efficiency. But throughout all aspects of mining, safety and compliance are our No. 1 priority,” said Gardiner. Viper is dedicated to safety and compliance and the crew works very well with the major regulatory agencies that have over-sight, both the Illinois Department of Natural Resources and MSHA. “We’ll continue to work with the agencies together to make this industry better and safer. Beyond compliance, we’ve got two obligations, one to our shareholders and stakeholders, and one to our employees. 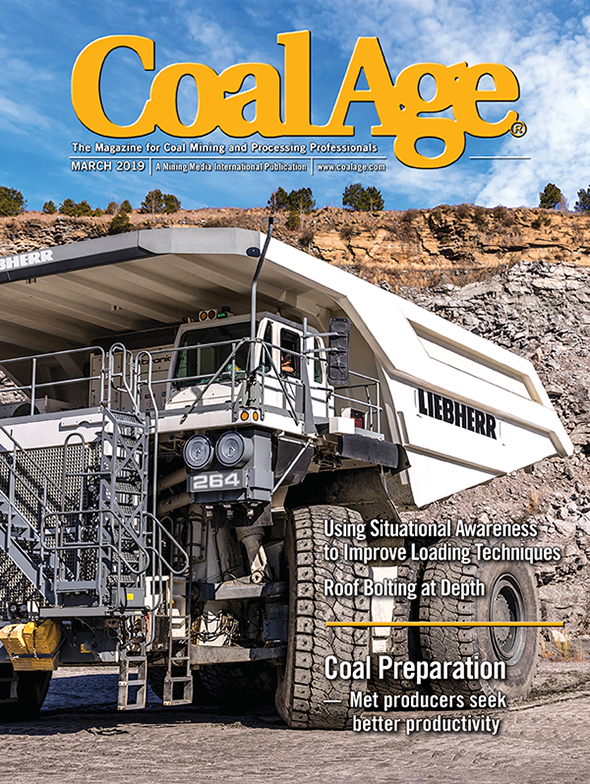 Through this investment, ICG is providing the tools we need for this workforce to hopefully enjoy 25 more years of productive and efficient coal mining,” said Gardiner. “I think this new slope is just the end of one chapter in Viper’s history and the beginning of a whole new and wonderful story. We’re poised now so that we can get into a great reserve area and, with this investment, we could get even bigger and better as an operation,” said Kauffman.